My very first edition of the Ultimate Fighting Weekly podcast is NOW available. I discuss UFC 156 as a whole and individual performances. Now that my website is up and running, YOU might receive the opportunity to write a guest blog! Once every 2 weeks, I will choose a new guest blog of the day! Pitch me an idea and if approved, you will receive the green light to write it. I will then post your blog on this website for all to view. This is an opportunity to blog about something you are passionate about and to promote yourself at the same time. If you are interested in guest blogging, head over to the “Contact” page and send me an email. Earlier in the day, I overheard a gentleman at the bank discussing his life-altering experience with a psychic medium. The individuals in line instantly jumped into the conversation with curiosity and overwhelming support. One person decided to shake his head in disappointment. Me. The dictionary defines a psychic as: A person apparently responsive to psychic forces. They are capable of extraordinary mental processes, such as extrasensory perception and mental telepathy. Chris Toplack defines a psychic as: A liar, fraud, crook, who takes advantage of others for the sole purpose of money or attention. Harry Houdini is widely considered to be the greatest illusionist and escape artist of all time, but he also dedicated a portion of his life to debunking all self proclaimed psychics and mediums. Houdini would travel from town to town, often in disguise, exposing every so-called medium he came in contact with. When the trickery was uncovered, he would rip off his disguise and proclaim, “I am Houdini! And you are a fraud!”. He went as far to offer a $10,000 reward to anyone who could ‘put over’ anything in so-called psychic phenomena that he could not detect. No one ever collected a dime from Houdini’s psychic challenge. No one can communicate with the dead. No one can read your inner thoughts. No one can accurately predict your future. Yes folks, it’s all a myth. The bells and whistles are meant to lure in the gullible and rob them of their precious hard earned money. The Chris Toplack Challenge: I invite any psychic medium to accurately predict, in detail, what I just ate for dinner. Over the course of my life, I have heard more than just a few individuals argue that competition is a horrible aspect in society. I personally found this argument to be rather vague as the reasons given were nearly non-existent. What’s so wrong about competition? In fact, I am firm believer that competition brings out the best in a person. It Keeps You Motivated: What better way to keep you motivated than a fellow competitor vying for your spot in the office. If this doesn’t make you perform at your absolute best, then I’m not sure what will. It Encourages Creativity: Let’s pretend for a second that you and your fellow co-workers are pitching an idea to the big boss. Everyone around you has the same thing in mind “stand out above the rest!” This will have you firing on all cylinders and force yourself to be creative. It Keeps You Focused: If a competitor is nipping at your heels in any aspect of life, you will be more focused than ever for the task at hand. Just as animals compete for pray, we compete on a daily basis with each other. Whether it be at the hockey rink, in the workplace or at school, competition is something that has become all too natural and common. Rather than shun competition and call it repulsive, convert it into something positive by allowing it to bring out the best in you. My latest video features a song that I composed for a good friend of mine. If you are looking for a laugh, feel free to check it out. I have been an independent voice over artist for nearly two years and thoroughly enjoy providing quality service to my clientele. As opposed to many other artists, I work strictly by word of mouth and referrals. This allows me more time to focus on each task at hand and to get it done in both an effective and timely manner. I have been contracted to provide voice over material for commercials, promos, instructional videos, educational videos and public service announcements. If you or anyone you know of is need of voice over work, feel free to listen to my voice over samples. I also have samples on YouTube. Send me an email on the Contact Me page for more information. Can this fear be overcome? Yes! Before I provide my tips, I want to share with you my thoughts on the subject. I honestly use to despise speaking in public. Despite making others smile and laugh throughout my childhood, public speaking did little to appeal to me. And much like everyone else, it made me quite nervous. These are the tips that allowed me to not only conquer my nerves, but also help turn public speaking into my most valuable asset. Slow Down – The quicker you speak, the more likely you are to make mistakes. Speak at a comfortable pace and never leave that comfort zone. Know Your Material – Choose a topic that interests you and do plenty of research. Don’t Obsess Over Mistakes – Even the professionals make errors. Stay composed and keep moving forward. Speak With Confidence – Make eye contact, smile, project your voice, choose your words carefully and enunciate. Practice – Rehearsing in front of the mirror is a tried, tested and true method of perfecting a speech or presentation. Attempting to “wing it” is a recipe for disaster. These tips allowed me to successfully host my own radio programs with thousands listening at any given time, present important material in front of business professionals and even speak on stage in front of 15,000 people and feel completely at home. Sure I had a few butterflies in my stomach, but that fear was non-existent. I just posted a new video: My Top 5 Favourite Movies of the 2000’s! Which will make my list? You have to watch to find out! I am sure there has been at least one moment in your life when you felt the urge to gain revenge on a person or situation. Perhaps you were deceived, mislead, betrayed or even abandoned. You have this vision of rising from the ashes to conquer all and reign supreme. You want to gain the upper hand and embarrass those who have held you down for too long. Well, I’m about to share with you the best revenge of all, moving on! I firmly believe that moving on from a person, situation or company that has purposely set out to deceive you or hold you down is the best revenge of all. Proving that you can be the better person and take the high road. Proving that you can still be successful and stay true to yourself. That’s what revenge should be all about. An old friend of mine from college was recently released from his job. It was no fault of his own, but to say he felt betrayed is a vast understatement. He was absolutely devastated and in a state of shock. His contributions to the company over a 6-year span were undeniable. He earned a large sum of money, made hundreds of business deals, gained the respect of his fellow co-workers and was widely considered to be their biggest asset. What went wrong? One of his bosses made a horrible mistake that cost the company a great deal of money and rather than accept fault, he blamed it on my friend. He took the high road and did manage to find success elsewhere. Good people don’t always finish last. It just takes a positive attitude and patience to find that golden opportunity. Don’t ever allow the lingering thought of revenge bring you down to someone else’s level. Keep your head high, move on and never look back! The rest will eventually fall into place. Exciting News: A New Partnership! 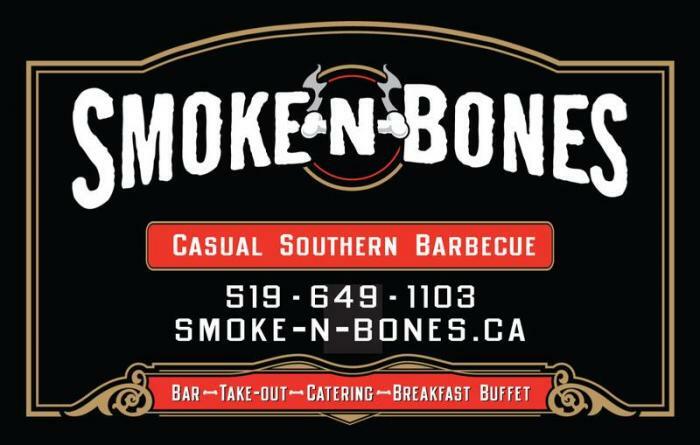 I am pleased to announce a new partnership with Smoke-N-Bones Restaurant in London, Ontario. Every Monday evening, I will be the host of Pub Stumpers. This will officially begin on Feb 11th! Amazing food, cheap drinks, trivia and your very own Chris Toplack! Hope to see you at Smoke-N-Bones on February 11th!